For individual home users, the most popular firewall choice is a software firewall. Software firewalls are installed on your computer (like any software) and you can customize it; allowing you some control over its function and protection features. 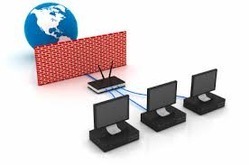 A software firewall will protect your computer from outside attempts to control or gain access your computer, and, depending on your choice of software firewall, it could also provide protection against the most common Trojan programs or e-mail worms. Many software firewalls have user defined controls for setting up safe file and printer sharing and to block unsafe applications from running on your system. Additionally, software firewalls may also incorporate privacy controls, web filtering and more. The downside to software firewalls is that they will only protect the computer they are installed on, not a network, so each computer will need to have a software firewall installed on it. Vertex Enterprise is a leading IT solutions and service providing center. Established at Nadiad, today we are technically advanced and ready to serve even the toughest of the technical IT challenges. Along with providing IT solutions in terms of both Hardware, Software, Networking, Security solutions(IT), Project works and Energy Saving Products. Our integrated and organized efforts render quality and reliable products and services. We provide solutions, suggestions, software, hardware and other products as per customer needs that are of high quality yet economically viable. We have a highly skilled force of engineers who are at their toes to provide services at the click of a button. Our maintenance and up gradation services are highly reliable and just a phone-call away.